(SportsNetwork.com) - Hyun-Jin Ryu tries to pitch the Los Angeles Dodgers to their fourth straight win on Friday when they continue a four-game series with the St. Louis Cardinals at Dodger Stadium. 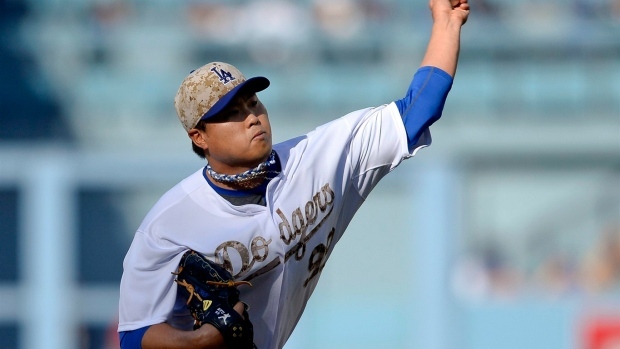 Ryu has been brilliant this season for the Dodgers, going 9-3 with a 3.06 ERA. The Korean hurler won his second straight start on Sunday, as he beat the San Diego Padres by holding them to a run and four hits over six innings. He had allowed a run and three hits over six innings to win his previous outing. Since May 21 Ryu is 6-1 with a 3.12 ERA in seven starts. "I think everything's working for him. This guy can pitch," Dodgers manager Don Mattingly said. "It's every time out. He locates. He's coming up with a cutter now. He's got a little slider he's working on. This guy's getting more pitches. Last year, he's pretty much two pitches. Now, he's starting to add pitches to his repertoire. He's a handful. That guy can really pitch." Ryu beat the Cardinals the only other time he faced them in the regular season. St. Louis, meanwhile, will counter with 22-year-old righty Carlos Martinez, who will be making just the fourth start of his career. Filling in for an injured Michael Wacha, Martinez beat the Philadelphia Phillies on Sunday, as he limited them to a three runs and three hits in five innings to improve to 1-3 to go along with a 4.33 ERA. However, both starters have their work cut out for them if they plan on matching the efforts on the hill in Thursday's opener. Los Angeles continued to roll in that one, as Justin Turner's eighth inning RBI single carried the Dodgers to a 1-0 win. Juan Uribe, activated off the disabled list before the game, scored the winning run while Miguel Rojas had two hits for the Dodgers, who have won eight of their last 10 games. Josh Beckett pitched seven strong innings, giving up just four hits and two walks with four strikeouts. Brian Wilson (1-2) got the win for tossing a flawless eighth inning. "He's been pretty amazing this year," said Los Angeles manager Don Mattingly about Beckett. "That's a good hitting club over there. He used all his pitches tonight. This was kind of like a playoff game." Adam Wainwright (10-4) suffered the tough-luck loss as he gave up just one run on five hits with a walk and seven strikeouts in eight innings of work for the Cardinals, who had won four of five coming in. "It was a tough loss," said Wainwright. "I felt I threw the ball well. I left a couple over the plate in the eighth inning and they got a hold of them. We faced a good pitcher over there. It's disappointing, but I'm not going to hang my head about it." This series, of course, is the first between these teams since the Cardinals defeated the Dodgers, four games to two, in the NLCS. Los Angeles did win the season series, however, 4-3.